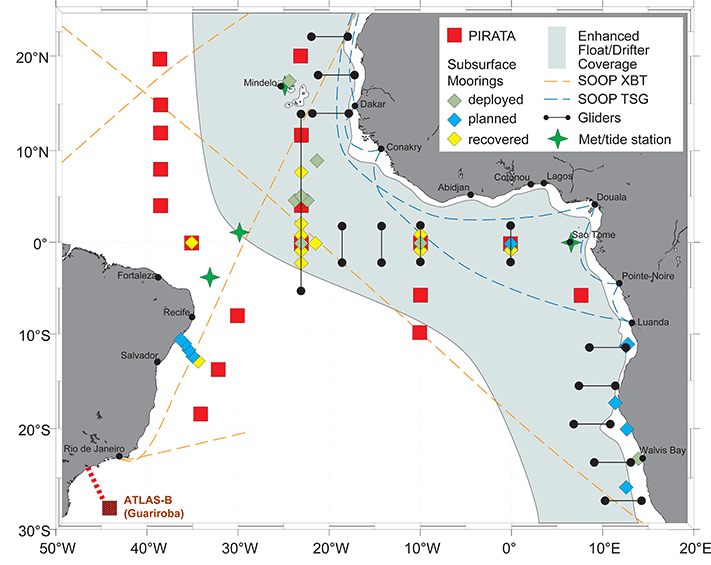 PIRATA is a program designed to study ocean-atmosphere interactions in the tropical Atlantic that affect regional climate variability on seasonal, inter-annual and longer time scales. The array was originally developed in the mid-1990s and has undergone expansions and enhancements since 2005 to improve its utility for describing, understanding, and predicting societal relevant climate fluctuations. PIRATA has been implemented through multinational cooperation in support of CLIVAR, GOOS, GCOS, and GEOSS. Financial, technical and logistic support are provided by France (IRD in collaboration with Meteo-France, CNRS and IFREMER), Brazil (INPE and DHN) and the USA (NOAA). Data are freely available for research and operational applications via the World Wide Web and the Global Telecommunications System (GTS): http://www.pmel.noaa.gov/pirata/.